Globally, late blight (Phytophthora infestans) is the most destructive pathogen of potatoes, and has been identified as the cause of potato famines in Europe dating back to the 1800s. Professor Jonathan Jones from The Sainsbury Laboratory in Norwich, England is investigating ways that Maris Piper potatoes can be genetically modified to develop late blight resistance. Heather Briggs reports. 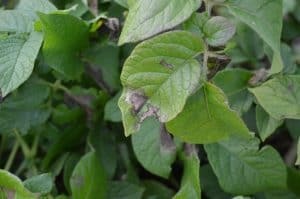 Late blight is one of the most destructive diseases of potatoes worldwide, estimated to cause annual losses of 15 per cent of global potato production. According to the Agriculture and Horticulture Development Board (AHDB Potatoes), it costs the British potato industry an estimated £50 million (approximately AUD$87 million) annually in crop protection products in a typical blight pressure season. According to Professor Jonathan Jones of The Sainsbury Laboratory in Norwich, United Kingdom, genetic modification has real potential to offer growers agronomic benefits, particularly in terms of developing late blight resistance. Against a background of aggressive potato late blight strains, combined with increasing losses of chemical plant protection tools, crops carrying genes that confer increased disease resistance would help to take the pressure off growers. These crops would facilitate optimised integrated pest management, and although Professor Jones does not envisage an end to fungicide applications, they may not need to be added at the present rates and frequencies. L-R: Professor Jonathan Jones and postdoctorate students Kamil Witek and Marina Pais. Images courtesy of Professor Jonathan Jones. 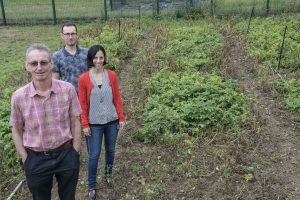 Professor Jones is leading a team which has developed a new, improved Maris Piper potato with a stack of three genes that confer resistance to late blight. These lines successfully underwent field trials in the United Kingdom in 2017 and are on track to help fight the new blight strain 37_A2, which has established itself in Northern Europe over the last few years. Fit, aggressive, and insensitive to the fungicide fluazinam, this strain comprised 24 per cent of UK samples identified in 2017 by Dr David Cooke from the James Hutton Institute, who carries out blight monitoring for the levy body AHDB Potatoes’ ‘Fight Against Blight’ campaign. It has also been identified in tuber blight. “Each blight resistance gene can be considered a mode of action, and relying on just one mode of action is a risky strategy,” Professor Jones said. “As we have successfully inserted three blight resistance genes, there will be three modes of action against the pathogen. Fungicide applications will still be used to control early blight (Alternaria), so these will provide a fourth mode of action. As a result, it will be more difficult for the pathogen to mutate so it can evade all of them and break the resistance. Blight symptoms on a leaf of GM Maris Piper. He added that deploying blight-resistance genes can be compared to antibiotic use, where reliance on a single mode of action eventually selects for mutations that select for strains that resist the antibiotic. Moreover, the timeliness of fungicide spraying when blight pressure is high and inoculum is present will not be so crucial, because the grower will be able to wait until the land is dry enough to take the weight of the spraying machinery without risking the loss of valuable crop. “Even if the pathogen does get onto the crop, it will not be able to multiply as quickly as it would on a non-resistant variety, which will help slow down the speed of spread,” Professor Jones said. One of the benefits of Professor Jones’ projects is that the genetically modified potato will be the UK’s most-grown variety, Maris Piper – but with these additional traits. This is possible because adding specific genes for resistance does not affect the other characteristics of the variety, Professor Jones explained. Using similar methods, he aims to incorporate resistance to potato virus Y and bacterial wilt (Ralstonia solanacearum), and perhaps even potato cyst nematode. The modified Maris Piper will also carry traits which will enhance tuber quality; by silencing the chemical compound polyphenol oxidase, these potatoes will be less prone to bruise damage. “This will make it easier to ensure the potatoes reach customer quality specifications and will help reduce wastage at harvest, particularly in difficult years,” Professor Jones said. In addition, by silencing an invertase enzyme, the potato will have lowered levels of reducing sugars and cold-induced sweetening, reducing blackening and formation of acrylamide when cooked at high temperatures. Invertase converts sucrose to a mixture of glucose and fructose. 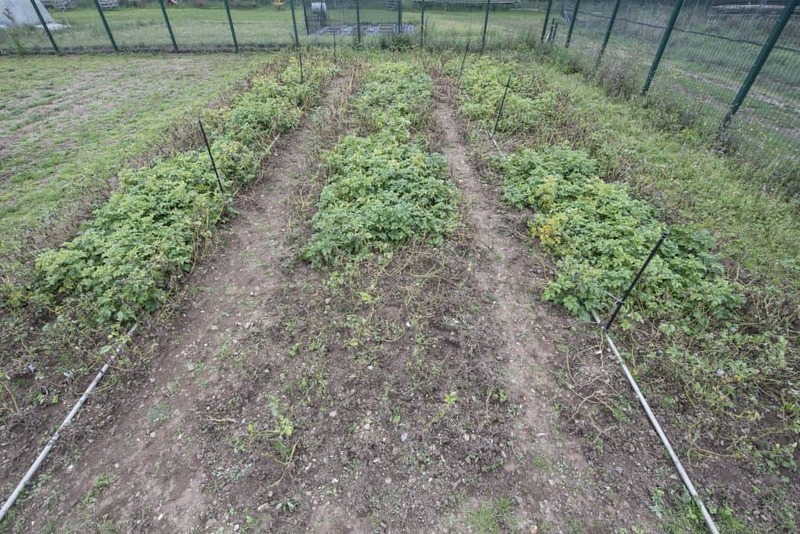 Overview of the field with dead control plants next to their resistant GM potatoes. This project is not Professor Jones’ first work with genetic modification in potatoes. In 2010-12, a blight resistance gene from Solanum venturii was inserted into the variety Desiree. This gene conferred resistance in the field and the United States-based company Simplot has licensed this gene for commercialisation in the US. Professor Jones pointed out that natural genetic modification has been going on for thousands of years. “Agrobacterium has evolved to insert DNA into plant cells, so there is nothing unnatural about a crop that has been transformed by Agrobacterium,” he explained. “Agrobacterium naturally introduces DNA that alters the plant’s hormones and causes galls, and modifies the plant’s own metabolism so that it supports the bacterial growth. For example, sweetpotato is the result of a natural event that introduced Agrobacterium DNA into the crop plant. For more information, please visit The Sainsbury Laboratory at tsl.ac.uk. Original article, courtesy of Potatoes Australia.